The style of this gown reflects the transitional nature of early 1780s dress. The elbow-length sleeve and pointed waist are typical of the 1770s, while the front-closing bodice and stitched pleats at the back look forward to the new fashions of the 1780s. This gown represents an informal style for a wealthy woman, and was known as a morning gown. The darker colours were appropriate for a winter gown. A petticoat, possibly a quilted one, would have been worn underneath and shown at the opening of the gown in front. While appropriate as informal dress for a woman of means, this gown might also have acted as 'Sunday best' for a working-class woman. The mechanisation of the spinning of cotton reduced the cost of the fabric. Distributing the material through regional retailers and travelling pedlars meant that new designs were available throughout the country and affordable by all but the destitute. The vibrant hues of this printed English cotton demonstrate a variation from the light palette of Neo-classical dress. A repeating pattern of floral sprigs within brown leaf trails has been printed in ochre, madder and green. The blue thread in the selvedge of the fabric indicates that it was made in England, most probably Manchester. 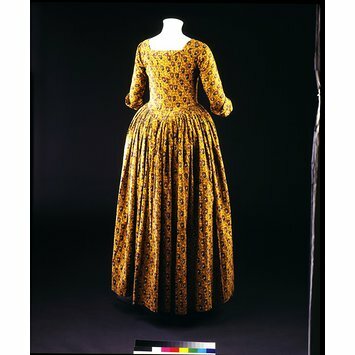 Dress of block-printed cotton in ochre. The design is of floral sprigs in small lattice on green and yellow ground. The gown has a close fronted bodice, an open fronted skirt and an English back. The sleeves have a small turn back cuff. The bodice is lined with linen. 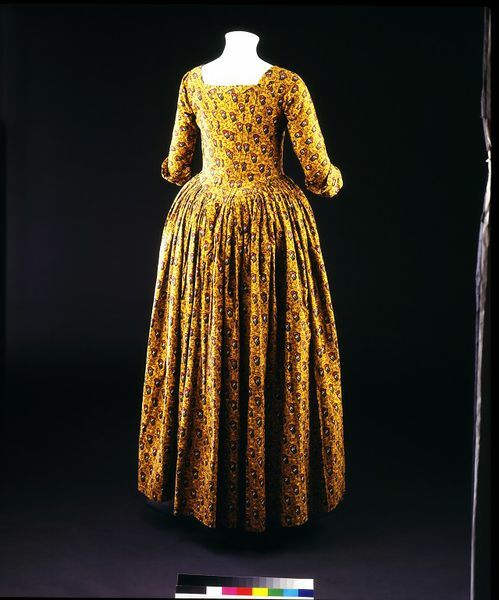 Dress of block-printed cotton, England, 1780-1785.